The long terminal ‘i’ added to the Sanskrit adjective kundalin, meaning “circular, spiral, coiling, winding,” makes a feminine noun signifying “snake,” the reference in the present context being to the figure of a coiled female serpent—a serpent goddess not of “gross” but of “subtle” substance—which is to be thought of as residing in a torpid, slumbering state in a subtle center, the first of the seven, near the base of the spine: the aim of the yoga then being to rouse this serpent, lift her head, and bring her up a subtle nerve or channel of the spine to the so-called “thousandpetalled lotus” (sahasrara) at the crown of the head. 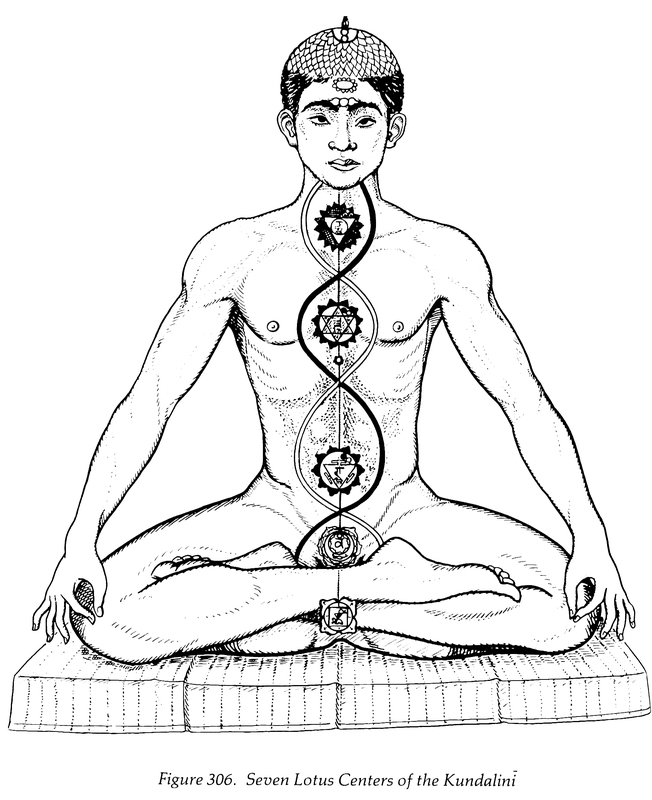 This axial stem or channel, which is named sushumna (“rich in happiness, highly blessed”), is flanked and crossed by two others: a white, known as ida (meaning “refreshment, libation; stream or flow of praise and worship”), winding upward from the left testicle to right nostril and associated with the cool, ambrosial, “lunar” energies of the psyche; and a red, called pingala (“of a sunlike, tawny hue”), extending from the right testicle to left nostril, whose energy is “solar, fiery,” and, like the solar heat of the tropics, desiccating and destructive. 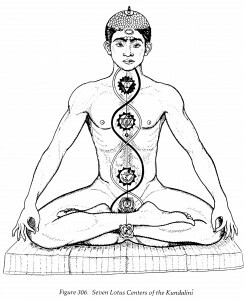 The first task of the yogi is to bring the energies of these contrary powers together at the base of his sushumna and then to carry them up the central stem, along with the uncoiling serpent queen. She, rising from the lowest to the highest lotus center, will pass through and wake the five between, and with each waking the psychology and personality of the practitioner will be altogether and fundamentally transformed.